your support is graciously appreciated! which depend largely on community involvement. Here are some of the ways you can participate starting right now! Become familiar with The Schedule of Events, click the hyperlinks for information and talk about it to everyone you meet! 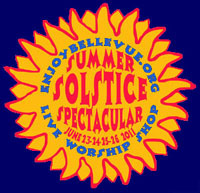 ...be seen wearing a Summer Solstice Spectacular t-shirt and register! Many more opportunities are available for participation! There are always photo ops! Making and Posting directional/informational signage is a plus! 6:00 pm Register the Pampered Pooch Promenade entries for their owners! Tear-down and Clean-up following the parade and event is most appreciated. Visit the local restaurants and pack a picnic basket full of food and treats and bring the family to Bayne Park early for a relaxing repast. Meet and Greet as you make your way to your "street" where you will find countless others who live or have lived on your "street" and get acquainted with past and present residents. After an enjoyable evening, please assist in the clean-up effort by picking up the debris in the surrounding area, putting trash in its place and help keep Bayne Park beautiful! 7:30 am -Rise and shine early, Artisan/Craft Market set-up is loaded with fun! Assist vendors coming in, post essential signs and balloons for events on the schedule! 10 am-4 pm Information Booth at the Craft Market - Schedule one hour to promote Bellevue, and the Summer Solstice Spectacular event by providing information to visitors, directions to events, selling 50/50 raffle tickets, t-shirts, buttons, flags in support of the event. 10 am-4 pm Volunteer to record the events and activities of the day with a still camera or video recorder for posting online! Take a walk around the Bayne Park and the Business District and chat with residents and guests in Bellevue about Bellevue. Provide information about the events. 10:00 am Arrive in Bayne Park to assist with setting up for the Artists' experience. Stay on and offer helping hands with the process. 10:30 am-1:30 pm Get into costume as a giant puppet and see all the smiling faces throughout Bellevue! All are welcome to shine like the sun! 10:30 am-1:30 pm Painting the smiling faces of the children in the Park is always fun for everyone, or consider volunteering for the Caricature Crew. 11:30 am Welcome Bike/Scooter Decorating Contest entries to register. 11:30 am Register entries for the Car Cruise arriving on Hawley Avenue. Direct traffic to the cruise entrance from Lincoln Avenue open the "gate" at Bayne Avenue. Tear-down and Clean-up following the activities in Bayne Park at 2:00pm and the Hawley Avenue Municipal and Bayne Avenue after 4 pm is most appreciated. 12:45 pm Hand out Garden Party Tour maps for the self-guided tour! Volunteers please send email to info@enjoybellevue.org noting your availability and preference. This is not meant to be a comprehensive list of volunteer opportunities, if something is missing, let us know! You will be contacted promptly concerning your specific interest and availability. Thank-you!